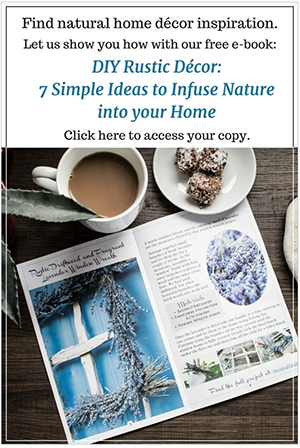 If you’re looking for rustic centerpiece ideas that are unique and inexpensive to make, we’ve got a great option for you. It’s a bit unexpected and kinda quirky, not at all the traditional floral-themed centerpiece you’re used to seeing. We created this unconventional centerpiece as part of my rustic chic Fall home tour. 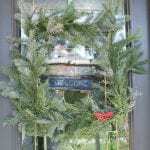 There you’ll find links to nearly two dozen addition fall home tours which feature many unique centerpiece ideas. So be sure to check it out! We are all about incorporating natural elements in our home decor so this centerpiece is the perfect addition to our woodland inspired Thanksgiving tablescape. But it doesn’t only look great for Fall, it’ll still be just as lovely in the Winter and even in the Spring season. 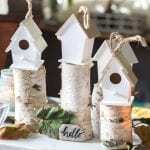 Whether you’re looking for ideas for rustic wedding centerpieces, baby showers or just for your own home decor, this birdhouse village is one to try. 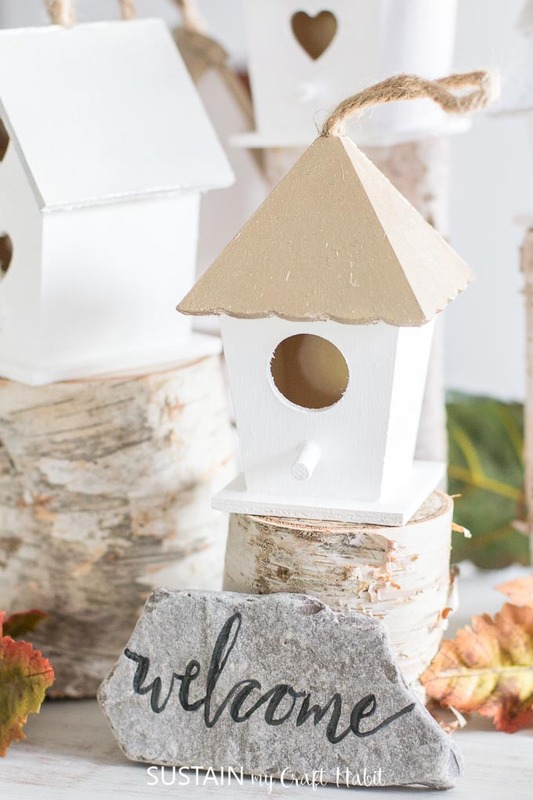 Your party guests can even take these painted birdhouses home as part of their thank-you gift! 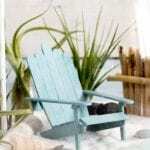 We have even more rustic centerpiece ideas for you including our DIY Beachy Air Plant Mini Garden Terrarium and our DIY Inscribed Beach Stone Centerpieces . And hang tight, we’ll be sharing this personalized hand lettered rock idea on the blog soon. 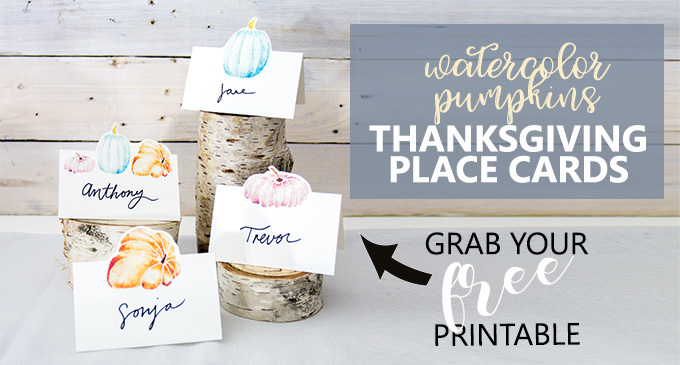 And be sure to grab our free printable Thanksgiving place cards. Just print out the template, cut out the shapes and write your guests names! Start by protecting your work surface with newspaper or a piece of parchment paper. 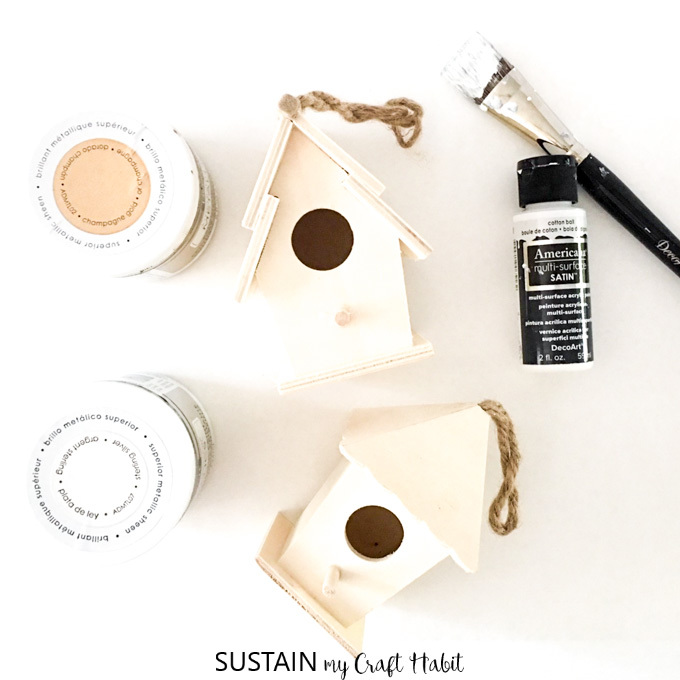 Paint the base of the birdhouses in a crisp white paint color. Leave the paint to fully dry before applying a second coat and continue until you’ve reached the desired coverage. Next, paint some of the birdhouse roofs in metallic silver and the others in metallic gold. Leave the paint to fully dry before applying a second coat and continue until you’ve reached the desired coverage. If you are cutting your own birch pillars, ensure the cut birch branches are level at the top and bottom. 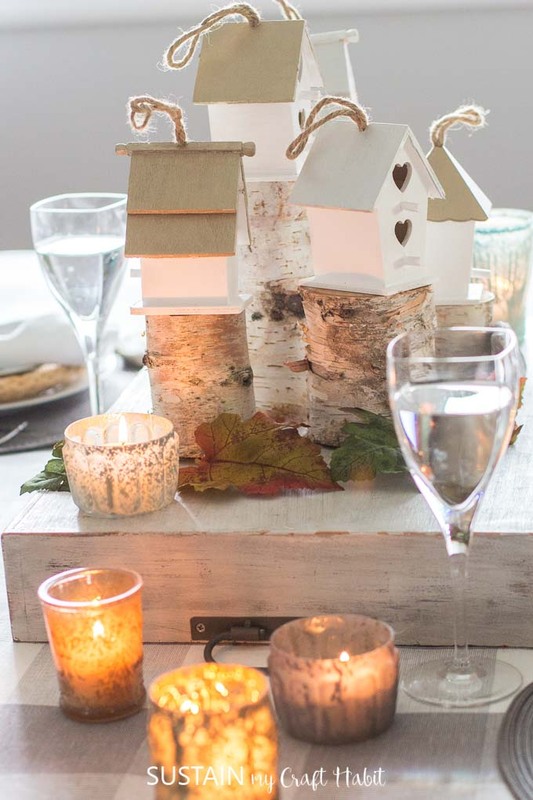 Assemble the birch branches in the center of your table in a small grouping like we did here. Place the painted birdhouses on top of the cut birch branches. And remember to turn the birdhouses in opposite directions so there are good views of birdhouse village from all the seats around the table. If your centerpiece needs to be moved for when dinner is served, consider placing it on a movable tray for easy transporting. 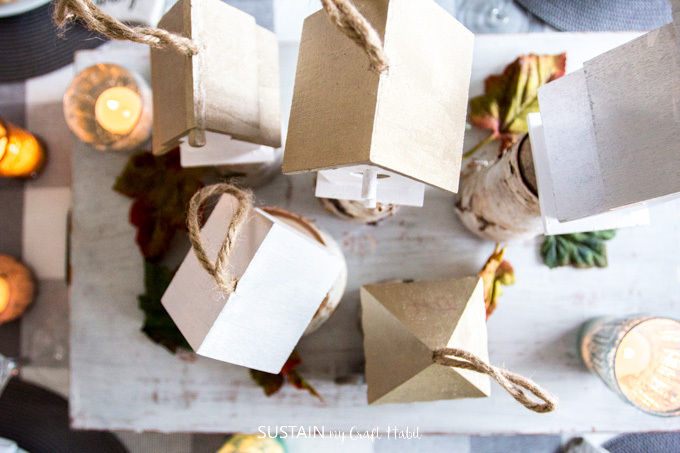 We had so much fun creating this inexpensive and unconventional rustic fall tablescape. You may also enjoy this quick painted rock idea video tutorial: pumpkin rocks! They make a great compliment to this whimsical table. 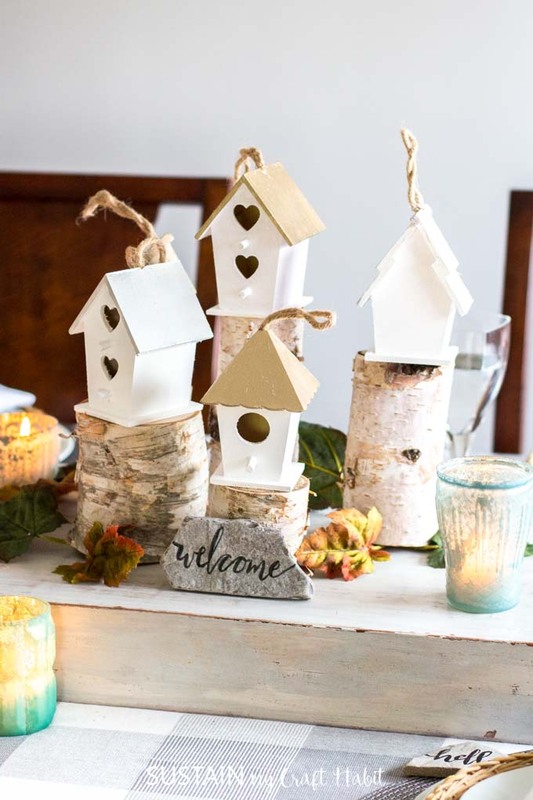 What other occasions would you use this birdhouse village centerpiece idea for? Looking for rustic centerpiece ideas? 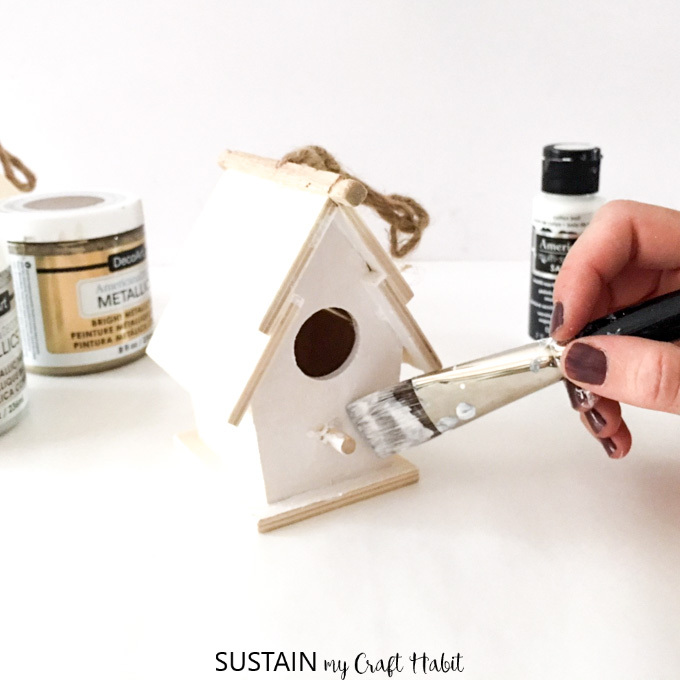 Try this birdhouse village centerpiece by assembling a collection of painted wooden birdhouses. Paint the walls of the birdhouses in a crisp white paint color. 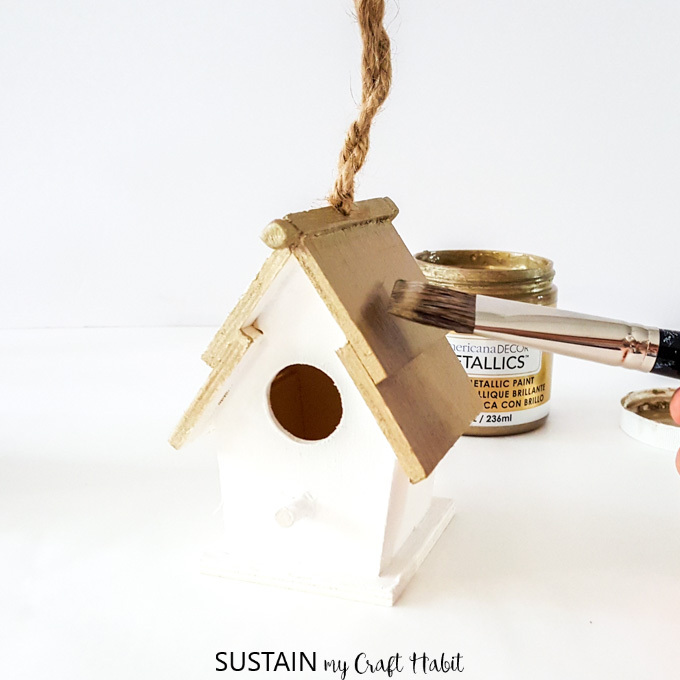 Paint some of the birdhouse roofs in metallic silver and the others in metallic gold. Once dried, assemble the birch branches in the center of your table. Finally, place the painted birdhouses on top of the birch branches. This is such a sweet idea for a centrepiece and I agree that it transitions well to different seasons. 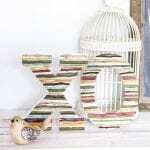 I also love the idea of having guests take a birdhouse home with them. So fun!